Richard Proulx went home to the Lord on Thursday evening, February 18, 2010, in Chicago, IL, after a long illness. Richard's work served the Lord and His Church with great creativity and faithfulness, and I ask for your prayers for his blessed repose. His biography is posted here. Yesterday I posted a brief note on the good work of CRUDEM and encouraging all of us to pray and to consider making a financial gift to help the relief efforts. It seems as though prayer is working and needs are being met. In my email inbox the following note was received and I thought it was a good illustration of the what is being done to aid the Haitian people in this incredible time of need. The author of this post is the president of the hospital foundation, CRUDEM, and a member of the Order of Malta. Today thanks to the efforts of many people and the generosity of an anonymous donor, 8 of our seriously ill children ranging in age from 3 to 13 were allowed by the Haitian authorities and UN to leave Haiti for treatment. A private jet from Western Massachusetts landed in Cap Haitian this morning filled with nurses and doctors from Baystate Medical Center and left with 8 children from Hopital Sacre Coeur accompanied by 2 physicians and 2 nurses. The jet landed 4 hours later at Bradley Airport [Hartford, CT] where there were 6 ambulances waiting. Since it was snowing and in the 20's the jet pulled into a hanger so the children could be protected. They were carefully carried to stretchers covered in blankets and given stuffed animals to accompany them on their trip to Shriners hospital (5 with serious orthopedic problems), a Boston burn unit (2 with serious burns), Baystate Pediatric intensive care unit (a girl with a fractured pelvis and other fractures). Our census is around 400 patients despite discharges such as the above miracle. We are still receiving transfer patients from the USS comfort. Our volunteers continue to work 16 to 20 hour days and are an inspiration to watch. My son who just returned was in awe of the Professors of Internal medicine, surgery and Ophthalmology who were changing bandages and caring for patients in the temporary hospital because that was where the need was. Egos and status are put aside and the only focus is on how best to care for our patients. The true volunteer spirit of being willing to do whatever is needed is evident in all of our teams. 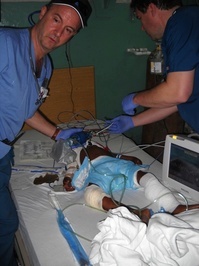 Typically we have about 170 volunteers come to Hôpital Sacré Coeur each year. Since the earthquake we have had over 250 and will continue to have at least 50 a week for the next 2 months. The list of people wanting to volunteer grows each day. This is proof for all of us that the majority of people are caring and want to help their fellow man. We need to remember this as we read and hear the negative in the media. Thanks to private donations by individuals, companies and nonprofits such as Americares and Project Hope, we are still receiving the supplies we need to keep the hospital running. Our food shortage has ended thanks to the generosity of Malteser International who is financing the shipment of truckloads of food from the Dominican Republic. God has blessed us in this time of tragedy with the many people who make the Miracles at Hôpital Sacré Coeur happen. Venerable Servant of God Pierre Toussaint, pray for us. Blessed Gerard, pray for us. 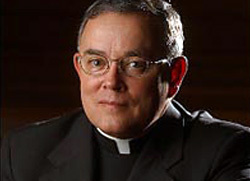 Someone who "gets it" is Capuchin Franciscan Archbishop Charles Chaput, archbishop of Denver. Whether it be culture, beauty, healthcare, abortion, immigrant rights, education, politics, preaching, I think the archbishop is a clear thinker and renders a fine and helpful assessment of Christian life and a Christians involvement in the world. Recently, Archbishop Chaput was in Rome to give a talk he titled, "The Prince of This World and the Evangelization of Culture" at the Fifth Symposium Rome: Priests and Laity on Mission. In this address the archbishop addresses questions of culture, beauty, anthropology, faith, evangelization and sin and grace. What follows is only an excerpt of a longer talk that you can read at the link above. AND I recommend you read the entire text! "Lucifer has cast the strong though invisible net of illusion upon us. He makes one love the passing moment above eternity, uncertainty above truth. He persuades us that we can only love creatures by making Gods of them. He lulls us to sleep (and he interprets our dreams); he makes us work. Then does the spirit of man brood over stagnant waters. Not the least of the devil's victories is to have convinced artists and poets that he is their necessary, inevitable collaborator and the guardian of their greatness. Grant him that, and soon you will grant him that Christianity is unpracticable. Thus does he reign in this world." If we do not believe in the devil, sooner or later we will not believe in God. We cannot cut Lucifer out of the ecology of salvation. Satan is not God's equal. He is a created being subject to God and already, by the measure of eternity, defeated. Nonetheless, he is the first author of pride and rebellion, and the great seducer of man. Without him the Incarnation and Redemption do not make sense, and the cross is meaningless. Satan is real. There is no way around this simple truth. "Where is there a place [in your thinking] for the fallen angel? . . . Is Satan only a rhetorical figure? . . . Or else, gentlemen, is he a reality, undeniable, recognized by tradition, revealed in the Scriptures, commented upon by the Church for two millennia, tangible and acute? Why do you avoid me, gentlemen? Are you afraid that the skeptics will mock you, that you will be laughed at in satirical late night reviews? Since when is the faith affected by the jeers of heathens and heretics? What road are you taking? If you forsake the foundations of the faith for fear of mockery, where will you end? If the devil falls victim to your fear [of embarrassment] today, God's turn must inevitably come tomorrow. Gentlemen, you have been ensnared by the idol of modernity, which fears ultimate matters and hides from you their importance. I don't mention it for my own benefit - it is nothing to me - I am talking about you and for you, forgetting for a moment my own vocation, and even my duty to propagate error." We live in an age that imagines itself as post-modern and post-Christian. It is a time defined by noise, urgency, action, utility and a hunger for practical results. But there is nothing really new about any of this. I think St. Paul would find our age rather familiar. For all of the rhetoric about "hope and change" in our politics, our urgencies hide a deep unease about the future; a kind of well-manicured selfishness and despair. The world around us has a hole in its heart, and the emptiness hurts. Only God can fill it. In our baptism, God called each of us in this room today to be his agents in that work. Like St. Paul, we need to be "doers of the word, and not hearers only" (Jas 1:22). We prove what we really believe by our willingness, or our refusal, to act on what we claim to believe. But when we talk about a theme like today's topic - "Priests and laity together, changing and challenging the culture" - we need to remember that what we do, proceeds from who we are. Nothing is more dead than faith without works (Jas 2:17); except maybe one thing: works without faith. I do not think Paul had management issues in his head when he preached at the Areopagus. Management and resources are important - but the really essential questions, the questions that determine everything else in our life as Christians, are these: Do I really know God? Do I really love him? Do I seek him out? Do I study his word? Do I listen for his voice? Do I give my heart to him? Do I really believe he's there? For more than 30 years, first as a bishop and now as the successor to St. Peter, Benedict XVI has spoken often and very forcefully about the "culture of relativism" that guides today's developed world, breaks down human community and intimacy, and drains the meaning out of human activity. That culture flows out of the "new Areopagus" John Paul II described in Redemptoris Missio - a culture formed by radically new technologies and methods of communication; a culture with a power that reshapes how we think, what we think about, and how we organize our personal and social lives. We have an obligation as Catholics to study and understand the world around us. We have a duty not just to penetrate and engage it, but to convert it to Jesus Christ. That work belongs to all of us equally: clergy, laity and religious. We are missionaries. That is our primary vocation; it is hardwired into our identity as Christians. God calls each of us to different forms of service in his Church. But we are all equal in baptism. And we all share the same mission of bringing the Gospel to the world, and bringing the world to the Gospel. 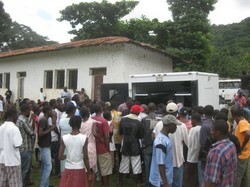 I've been getting daily updates from the CRUDEM folks in Haiti. I am sure many are keeping current on the efforts of those trying to help the earthquake victims. The stories of the tragedy and the human efforts sustained by God, I am convinced, move the heart. Financial gifts to an agency is a good thing AND so is prayer. Please consider making a contribution to AVSI, CRS and the Order of Malta is recommended and asking the Sacred Hearts of Jesus and Mary to guide this human process of aiding our Haitian sisters and brothers is crucial. When the earthquake was announced I mentioned asking for the divine mediation of Venerable Servant of God Pierre Toussaint: I renew that request. When you visit the Blessed Sacrament today make a prayer for Haiti! The crisis continues and so does the humanitarian efforts in the areas of medicine and food outreach to help the citizens of Haiti recover their lives. Human resources, budgets and food supplies are stretched thin, for obvious reasons. Many, many acts of kindnesses have be demonstrated. Keep yourself engaged by visiting CRUDEM. This page is a archive of entries in the Culture category from February 2010. Culture: January 2010 is the previous archive. Culture: March 2010 is the next archive.